The rules of style and footwear could appear simple sometimes. But there are common shoe style mistakes that we, unfortunately, see too often. We’ve outlined 5 common shoe mistakes that men make with the aim to address and resolve familiar footwear blunders. Keep reading to make sure you don’t make the same mistakes — and learn how to fix them if you do. When it comes to men’s dress shoes getting the right size can be tricky for some. If you’re wearing shoes that are either too big or too small you will notice a change in your gait, and how you carry yourself can say a lot about a person. Don’t let poor fitting shoes negatively affect what people think of you. Obviously wearing ill-fitting shoes will cause you problems with pain in the short-term, but these issues can be a lot more serious than a blister or two. Wearing the wrong size of shoe for extended periods of time can cause long-term problems like bunions and foot deformities such as hammertoe and toenail issues. The easiest, most pain-free solution is to simply have your feet measured by a professional. At Robinson’s Shoes, we offer a Professional Shoppers experience where a member of our expert team will measure your feet, give you advice on styles and ensure you find your perfect fit. Book an appointment at our Belfast or Carrickfergus store today for help and guidance. 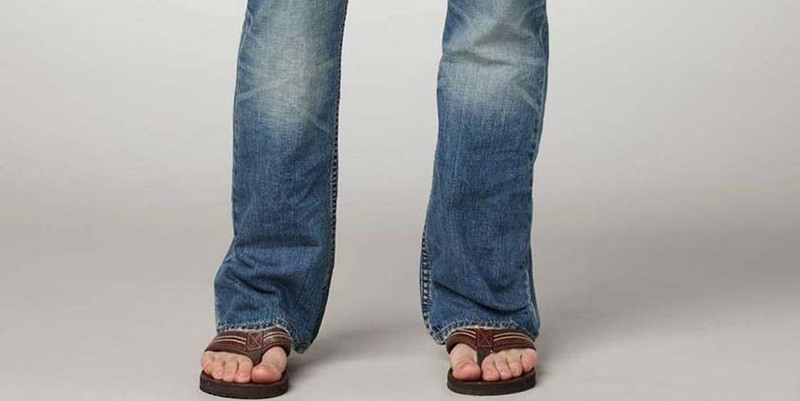 The juxtaposing sight of thick jeans and flimsy flip flops leaves us baffled. Guys, if it’s warm enough to expose your feet to the elements then the rest of your outfit should reflect this. Personally, we believe that flip flops should be restricted to poolside only. With a good book in one hand and an equally good drink in the other. However, if you don’t want to give up the freedom and lightness of a flip flop, but want to up your style game then we suggest an equally summery, yet infinitely more stylish alternative – boat/deck shoes. If you’ve gone to the effort of wearing a suit, you’re obviously trying to present the best possible version of yourself. Pressed shirt, fitted suit, dapper tie – please don’t ruin the look with clashing shoes. We’re thinking of all of the brown dress shoes that have been done a disservice by being paired with a plain black suit, this is a big fashion faux pas. If you want to rock a brown dress shoe, then we suggest a good pair of Oxfords paired with a navy suit or lighter and darker shades of grey. This is a much fresher and stylish colour combination. Check out this handy graphic that breaks down how to match your shoes and suit. Some men completely overlook how important shoes are to one’s total appearance. If you are dressed otherwise pretty well but your shoes are old and worn out, it really stands out. Invest in quality shoes to ensure longevity. If quality shoes are cared for properly these can last for years, thereby ensuing return on investment in the long run. Don’t just throw on whatever pair of old socks you’d normally wear to the gym with dress shoes. Take into account the outfit as a whole. From the cut of your trousers to the colour combination of your outfit and then match you socks accordingly. If in doubt a plain black pair is usually fail-safe. This is something that should go without saying, but do not wear mismatched socks. Also don’t be afraid to show some personality with your sock choice. We love to add some flare to an outfit by showing a peak of colour or pattern with the likes of these corgi pattern socks. In some cases you can forgo socks altogether, loafers with the right outfit looks great with bare ankles. We hope that this guide has shed some light on these 5 common mistakes that men make when it comes to footwear and how to fix them. Admittedly, this is just the tip of the ice-berg when it comes to footwear faux pas. Make sure you don’t fall victim to any fashion mistakes by following our style guides.